The Youtube clip below is an edited version of a television show I took part in this past Saturday in New York City. 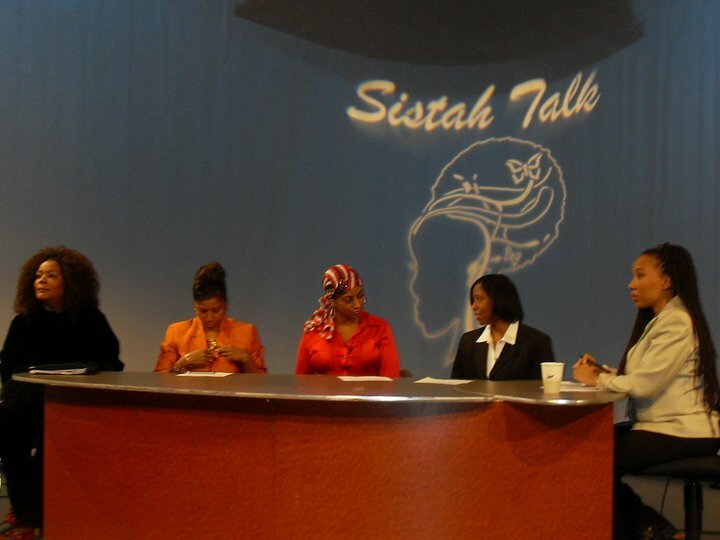 Sistah Talk TV is an up-and-coming public access talk show, produced by Zakkee Starman, designed to cater to the issues and lifestyles of Black women. Shawn Seymour Gipson, a friend I went to school with and have not seen for over 20 years, is the show’s co-host. When we reconnected via Facebook, she mentioned having seen my blog, MotivationTruth. She was quite intrigued as many people are when they find out that I, a Black woman, don’t espouse the agenda of the Democratic Party. After Shawn spoke to the show’s producer, he began to take a look at my work and contacted me about coming on as a guest. He feels that the Black conservative voice is one that is not often heard, and of course he is right. Regardless of his personal view of where I stand politically, he felt it important that people realize that not only don’t we all look alike, we don’t all think alike either. I refused his first few invitations, but eventually–after much thought, prayer, and counsel from people I trust–I made the decision to do the show. That takes us to Saturday. First of all, I was well-aware of what I was getting myself into. I’ve read some comments by my Black sisters recently that suggest that I should have known what was coming. Believe me, I knew what was coming, but I also know that there is substance behind where I stand, and I’m not usually one to be intimidated, although I certainly don’t like to be ambushed. The show was heated from the beginning. The guest panel consisted of two other guests: singer/actress/comedienne, Penwah Phynjuar, and Robin Michele Downes of yogaflava.com. The co-hosts are Dietra Kelsey and Shawn Seymour Gipson. Most of the opposition came from Penwah, a strong supporter of President Obama, who made her–shall we say?–disapproval of Governor Palin and those who support her quite apparent. In her mind, which she expressed freely, I am simply an ignorant sell-out, a “Kizzie,” not Black enough, the list goes on. She discussed her view that I’ve been played by what she deems to be flat-out racism on the part of Governor Palin, Republicans, and the Tea Party movement as a whole. There really wasn’t any reasoning with her, nor was there any evidence given to support her claims. I’ll let the video say the rest. Ms. Downes spoke well of conservatives’ focus of pulling oneself up by the bootstraps; however, she took issue with Governor Palin’s hunting as shown on “Sarah Palin’s Alaska,” to which I quoted the Governor: “We eat; therefore, we hunt.” I truly don’t understand how people who enjoy a good steak, chicken, or pair of leather shoes are offended by those who make each of those things possible–and enjoy doing it. People like the Palins hunt for food–not just for trophies. Although she and I disagreed on that issue, she conducted herself well. She was certainly professional and cordial. That conversation is not on this clip, but it will be viewed when the entire episode becomes available. The hosts, I felt, were clearly a representation of the Left, but they handled themselves well. Shawn came with the issues. Although she has bought into some of the lies out there about Governor Palin, she did not make it personal toward me. She was strong, yet respectful. Bottom line: as lively as our exchange became, we walked away agreeing to disagree, and we walked away with our friendship intact. Dietra had the difficult job of trying to be fair, giving each panelist an opportunity to speak, quelling the vitriol being thrown in my direction at times, and handling the calls coming into the studio. Some of the calls had me scratching my head. One gentleman stated that Governor Palin’s use of “soccer mom” (he meant hockey mom) during the campaign was a dog whistle for racism. Maybe it’s me, but how is it her fault if not many Black people play hockey? Should she apologize for being proud of the sport or her children’s involvement in it? I will leave my remarks at that. The Youtube clip gives you an idea, but you really won’t get the full effect until you see the full version. It truly was the lion’s den, and I suppose I was intended to be dinner, but I can bite back–respectfully. It saddens me that there are people out there who hold such hate for Governor Palin without any good reason, who accuse her of racism without any evidence, and who accuse me of selling out my race because I don’t need someone else to think for me but can reason on my own. I persevere nonetheless. My goals was to go and discuss the issues: why I support Governor Palin, what sets her apart from the others, what she’s fighting for on behalf of this country. I believe I did just. I thank Sistah Talk TV for allowing me a voice Saturday, even though it was indeed a battle, and the comments since then–some of them anyway–have been downright ridiculous. It is my prayer that I conducted myself in a way befitting a Christian, a professional, and an unabashed Governor Palin supporter–yes, even as a Black woman. Besides, the principles she espouses: respect for life, national security security, limited government, lower taxes, fiscal responsibility, and job creation know no color. They serve each of us well, and both the sistahs and brothahs out there would do well to at least listen with an open heart. There’s too much at stake to play the race game. You can see more pictures of that day here at Sistah Talk on Facebook.